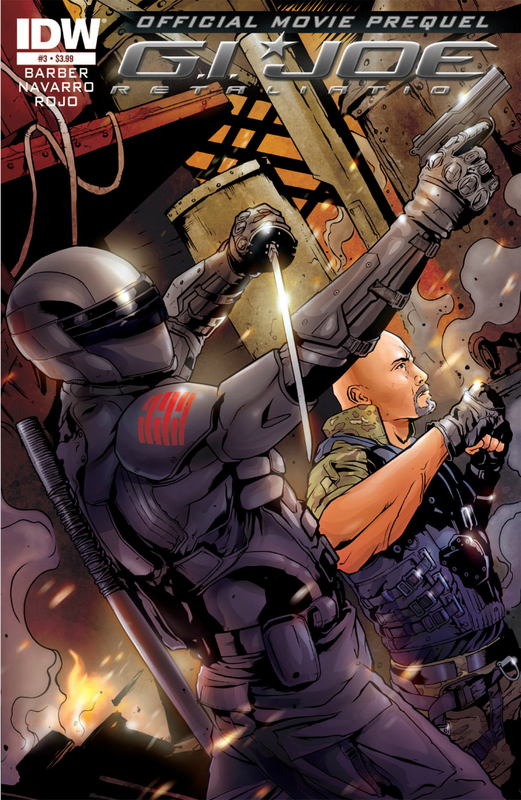 Roadblock receives special training from Snake Eyes and the Blind Master in preparation for their showdown with the Red Ninja. Through series of flashbacks, the relationship between Blind Master and Snake Eyes is explored. John Barber, Salvador Navarro, and Atilio Rojo bring us this third chapter to the G.I. Joe: Retaliation Movie Prequel. One of John Barber's goals in this series was not only to set the stage for the Retaliation movie coming out this summer, but also to tackle the more Herculean task of integrating this movie with the Rise of Cobra movie. In this sense, Barber's doing a phenomenal job. He's embracing scenes and characters from the first movie, such as the assassination of Hard Master, as he's setting the stage for the second, such as the introduction of Blind Master. Of course, ultimately we won't know how successful Barber is until Retaliation is released, but from what little we know from trailers and the toy previews, it seems he's doing a great job. At the same time, though, some fallacies of logic are starting to creep in. It's pretty much common knowledge (to some fans' disappointment) that Roadblock is a ninja commando in the Retaliation movie, having been trained by Snake Eyes and having developed his own style of ninjutsu: Battle Kata. I was a little surprised to see what I had assumed was an important plot point in the movie being so directly addressed in the prequel comic. Surprised, but also happy; because this might free up more room in the movie for more important or interesting plot points. But what we do get in the comic is disappointing: a clichéd training montage. Roadblock himself makes the comment early in the issue of the impossibility of learning “a thousand years worth of training in a week.” But apparently he does just that, as the next time we see him, he is able to defeat five ninja singlehandedly. Then, in the following scene, he is able to neutralize Snake Eyes in a battle sequence that I frankly found difficult to follow. Apparently, this Battle Kata involves the use of technology: what looks like modified brass knuckles, some snap-on guns, and explosives. And apparently, these guns can alternate shoot bullets and a grappling line. I'm not following why any of that necessitated Roadblock training with the Arashikage clan, or indeed, where he found the facilities to develop this special technology. I found the introduction of Battle Kata very empty and unsatisfying, although I will concede I'd rather have it treated in the comic this way than to waste precision minutes in the movie. The star of this prequel, like the star of the movie, is Roadblock, but in this issue, we got a lot of background information on Snake Eyes. We begin with the aftermath of the assassination of Hard Master, following his training with Blind Master, to his recruitment to G.I. Joe. Most of this was fairly interesting, especially the interactions with the Blind Master. The biggest disappointment, however, was the revelation that Snake Eyes is silent because of a vow. While I understand it is meant to show the honor and disciple of Snake Eyes, I believe it flies in the face of Snake Eyes as a soldier and as G.I. Joe as a military unit. All things being equal, having a soldier who does not talk can only be a liability in the field. A soldier who cannot talk because of injuries that occurred when he was rescuing a fellow soldier is commendable, and in my mind, it's excusable that the military would keep such a soldier on for active duty. But a soldier who refuses to talk because of the death of a foreign national over a decade ago makes little sense for his inclusion in an elite military unit, no matter how mad his ninja skills are. The more I see of Rojo's work, the more I enjoy it. Similar to the last issue, this book was split between “contemporary” (albeit pre-Rise of Cobra) and flashback sequences. Once again, Rojo handled the flashbacks, and the sequences have been beautiful. In contrast, Navarro's work suffers in comparison. His static images are fine, but I have a hard time following what is happening in the more dynamic parts of the story. This has been a problem throughout these three issues, but it seemed particularly noticeable with the two fight sequences between Roadblock and Snake Eyes. This was an important issue in that it introduces this “Battle Kata” fighting style, but for the life of me, I really couldn't understand visually what Roadblock was doing. During the flashback sequences of when Snake Eyes is leaving the dojo, his face is obscured by the shadow of his hat, very reminiscent of how he was portrayed in flashback sequences in Vietnam in the Marvel series. Very nice homage. Frankly, this issue was a disappointment for its clichéd training montage plot. Still, the flashback sequences with Snake Eyes and Blind Master were interesting, and lent some depth to the Rise of Cobra/Retaliation movie universe. Recommended.